The Summer Reading Club is a program designed by the State Library of Queensland and the Australian Public Libraries Alliance and utilised by public libraries around Australia. Running from December to January each year, children are encouraged to read a set amount of books per week, after which they receive stickers to record their efforts. After collecting all the stickers, children can win a prize to show off their reading prowess and skill. It’s a fantastic program that encourages children of all ages to get into reading and use the amazing library spaces that are available in their local community. Libraries that participate in the program use their diverse collections to reach out to children and foster a love of books and reading from an early age. Parents will love that their children are participating in building their literacy skills and gaining a love of the written word and recreational reading. Kids will love not only reading some truly great books, but the fun and sense of accomplishment they’ll get as they work through the program, and the prizes they’ll receive at the end. What can kids do at the library these school holidays? Your local library is a fantastic source of entertainment and fun these summer school holidays – so utilise that free library membership! Every library system around the nation has designed and will be delivering a host of amazing summer school holiday fun – from easy craft activities to science experiments, fun book or movie related activities and sing along programs, kids cookery classes, themed story time sessions, and a whole lot more! After you joined in the summer reading program, ask your friendly local librarian about the fun activities your child could take part in this summer – the kids will love it! Why May Gibbs HAS to be on your summer reading list! As we all know, May Gibbs and her wonderful books are so important to Australian children’s literature – and they’re so much fun as well! 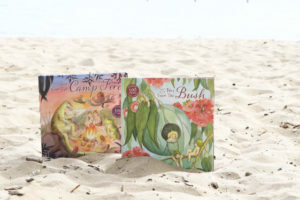 Your little ones will love reading about Snugglepot and Cuddlepie’s adventures, or flitting about the Australian bush with the gumnut babies as they get up to mischief. What’s more, May Gibbs’ books foster a love of the environment and Australian animals and plant life that you as a parent can totally get behind – you can point out things from the bush while on walks or when you go on a picnic at a wildlife reserve. You can conduct ‘treasure’ hunts with leaves and flowers you and your child discovered in the books. Whatever you can dream up, your little May Gibbs fan will love! For more information on fun and exciting May Gibbs-related activities for your children to get stuck into these school holidays, visit our page! « Australia Day Bush Inspired Australiana For Kids!